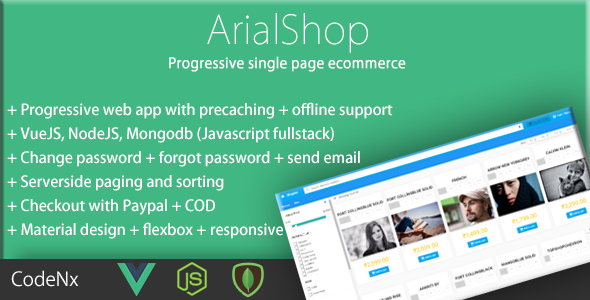 Offline Ready Progressive Web App, Bleeding edge, Fast, Lightweight SPA (single page application) ecommerce. This component based architecture results clean and modular code which has the power to acomodate any ecommerce customizations. This is based on ReST API and disconnected architecture. Hence you are free to use any front-end or backend. For the same reason I separated both store front and store back office. Now you are free to use any ecommerce service like Moltin or even Firebase. In simple terms I will call this Flipkart Clone. Although not as complete like the giant Flipkart , most of this scripts features are inspired from Flipkart resulting speed and better usability. This is highly scalable and can handle many connections at a time. Ecommerce giants like Amazon and Flipkart are based on the same cloud infrastructure. Being an asynchronous event driven architecture its speed goes upto 5 fold as compared to existing php or wordpress based ecommerce solutions.